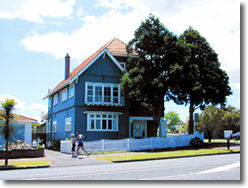 Kate and Lynne have welcomed hundreds of women to stay in their central Auckland homestay – The Big Blue House, where you can relax in a large bedroom with views. You will be also welcomed by the family’s friendly cat and dog. The Big Blue House is close to city – 10 mins drive or 15 mins by bus. It is just a short walk to Auckland Zoo and Museum of Transport & Technology (MOTAT). There is lots of parks and walkways nearby with just a 5 min drive to nearest swimming beach and pool. A must to visit is the famous Women’s Bookshop and Ponsonby Rd. Two large bedrooms (ensuite or shared bathroom), king beds, cable TV, desk, phone connection, sofas, tea/coffee facilities, heated towels, bathrobes. Eclectic range of books, playing cards and maps. Laundry facilities available. One single bedroom. You can luxuriate in the spa and pool at the end of a days exploring or take an easy stroll to local cafés. is it possible for two persons to stay in your place 3-2-2016 /5-2-2016?